Brighten those gray days of winter by growing a few beautiful begonias indoors. Select from those with colorful foliage, uniquely shaped leaves or flowers. You’ll have the greatest success growing fibrous rooted begonias that will flower in bright light and those with enlarged underground stems called rhizomes. These are grown for their leaves and tolerance of low light. Grow your begonias in a warm location away from drafts of cold and hot air. Water thoroughly as the potting mix just starts to dry and only fertilize actively growing plants. Place plants on gravel tray to increase humidity around the plant. Increase flowering and leaf color intensity by adding artificial light to your growing location. Many new compact and stylish lights make it easy to add light while keeping with your indoor decor. 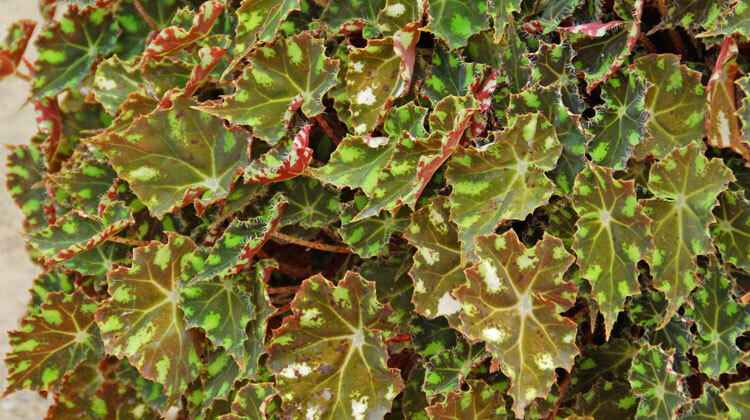 A bit more information: Rex begonia has long been grown indoors and more recently outdoors, for its colorful leaves. Its smaller stature makes it the perfect tabletop houseplant.